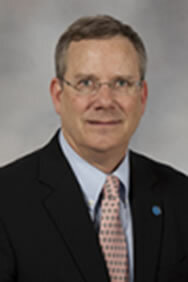 Robert T. Brodell, MD is tenured Professor and Chair of the Department of Dermatology and Professor in the Department of Pathology at the University of Mississippi Medical Center. He worked with a dedicated team of faculty to found the Department of Dermatology and establish a residency training program in dermatology in 2012. It currently boasts 11 resident physicians; fellowship trainees in dermatopathology and Mohs Surgery; 10 faculty; 5 nurse practitioners; and, sees patients in 5 offices. All of this was designed to improve the access to dermatologic care in a state that has half the number of dermatologists per capita average in the United States. Dr. Bob is a graduate of Washington and Jefferson College ('75) and the University of Rochester School of Medicine and Dentistry ('79) . Following two years of internal medicine residency at Strong Memorial Hospital in Rochester, New York, he completed his dermatology residency and dermatopathology fellowship at Barnes Hospital in St Louis, Missouri. He is a master mason (1974). For 27 years, Dr Bob was the director of Skin Pathology Services, Inc and served in a solo clinical practice of dermatology in his hometown of Warren, Ohio. He worked in the building where he and his wife, Linda P. Brodell, MD (Ophthalmology), lived and raised 5 children. During this time he served as chair of the Northeastern Ohio Medical University (NEOMED) Dermatology section where he was elected to the master teacher guild. He also served as Chair of the Midwest Congress of Dermatological Societies (1995-1999). Known for his passion for teaching, Dr Bob has performed 1,750 lectures and directed 45 symposia at local, regional, and national venues. He has 389 publications, 41 poster presentations, and has written two books: The Diagnosis and Treatment of Warts: An Evidence Based Approach (2003) and Tips and Tricks in Procedural Dermatology (2019). He has reviewed articles for 32 journals and served on the editorial board of 3 journals. Dr Bob is Editor-in-chief of Practice Update: Dermatology (Elsevier) a weekly digital abstracting service (2013-present) He has participated in 42 multi-center clinical trials. An avid mentor, over 100 of his medical students are now dermatologists. Dr. Bob served as President of the Ohio Dermatological Association (2002) ; member of the American Board of Dermatology (ABD) (2003-12) and served as the ABD President (2011-12); and, the Sulzberger Institute for Dermatologic Education (1998–2001). He is a member of the American Dermatological Association (2007), an organization of national leaders in dermatology and serves as its secretary-treasurer (2017-present). He served on the Board of Directors, American Academy of Dermatology (2012-16); Board of Directors of the Noah Worcester Dermatological Society (2017-19); and, the dermatology Residency Review Committee (RRC) of the Accreditation Council of Graduate Medical Education (ACGME) (2012-19).